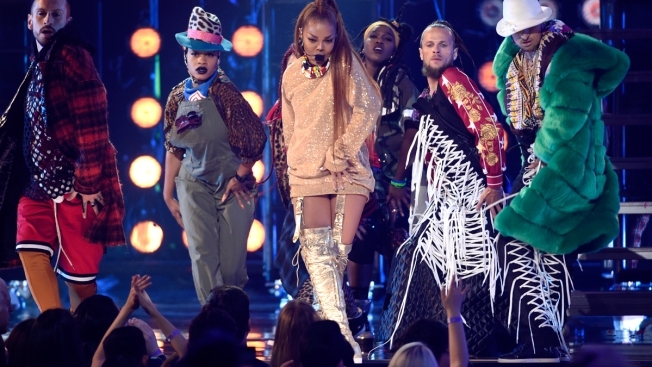 In this May 20, 2018, file photo,Icon award winner Janet Jackson performs a medley at the Billboard Music Awards at the MGM Grand Garden Arena in Las Vegas. Jackson, John Legend, The Weeknd and Shawn Mendes are among the artists slated to appear at the 2018 Global Citizen Festival. Who's ready for this year's Global Citizen Festival? Cardi B, Janet Jackson, Shawn Mendes, Janelle Monae and The Weeknd will headline this year's event, returning to Central Park's Great Lawn in New York City on Saturday, Sept. 29. After hosting last year's show, Hugh Jackman and Deborra-lee Furness are also coming back. John Legend will give a special performance during the festival, which will again air in full on MSNBC, E! 's sister network. More performers and presenters will be announced at a later date. Confirmed celebrity co-hosts include La La Anthony, Camren Bicondova, Rachel Brosnahan, Naomi Campbell, Cynthia Erivo, Danai Gurira, Gus Kenworthy, Kal Penn and Forest Whitaker. "This year's Global Citizen Festival has an amazing lineup of artists, hosts, and partners, and we could not be more thankful to them for their help in the fight to end extreme poverty. Activists and music fans will come together to call on world leaders to address some of our biggest problems, like improving the maternal health crisis, ending child marriage and reducing the use of plastics," Stephen Brown, Senior Director, Global Partnerships at Global Citizen, tells E! News in a statement. "This year, Global Citizen will also call on U.S. leaders to resist cuts to the American aid budget and end the criminalization of poverty by restricting and eliminating cash bail policies. It is a crucial year in which we all must speak up for policies that will help us achieve the global goals, and show up in the voting booth to hold our leaders accountable." Emmy winner Ken Ehrlich is producing Comcast NBCUniversal and MSNBC's broadcast. The festival will also be live-streamed on Twitter and YouTube, presented by Johnson & Johnson. Ahead of the festival, Global Citizen is calling on world leaders to end child marriage, tackle the maternal health crisis and reduce use of plastics, and it's calling on U.S. leaders to fund foreign aid and end the criminalization of poverty. "In 2018, it is more important than ever for Global Citizen here in the United States and around the world to demand their voices be heard--through activism and at the polls--so that we can continue progress towards a world free from needless suffering and want," Hugh Evans, CEO of Global Citizen, told E! News. "We are truly grateful to have such incredible artists, hosts and partners standing with us in a moment of history so pivotal in our fight to achieve the global goals and end extreme poverty." The festival, presented by Citi, has also named iHeartMedia its exclusive audio media partner. "We're incredibly proud to take our support of Global Citizen Festival to the next level as presenting partner," Jennifer Breithaupt, Global Consumer CMO at Citi, added. "As a global bank that is committed to welcoming what's next, we look forward to helping bring together citizens around the world to stand for issues that matter most and foster meaningful change." Fans can earn admission to the free-ticketed festival in two ways: by joining the movement online or by downloading the Global Citizen app. Drawings will occur throughout the summer. Coinciding with the annual United Nations General Assembly meetings, this year's festival is a continuation of Global Citizen's "Mandela 100" campaign, a series of worldwide events honoring the life and legacy of Nelson Mandela in his centenary year. The first South African Festival is set for Dec. 2 at FNB Stadium in Johannesburg, where Beyonc, D'Banj, Jay-Z, Femi Kuti, Sho Madjozi, Chris Martin, Cassper Nyovest, Tiwa Savage, Ed Sheeran, Usher, Eddie Vedder, Pharrell Williams and Wizkid are set to perform. The event's hosts include Naomi Campbell, Sir Bob Geldof, Gayle King, Tyler Perry, Bozoma St. John and Forest Whitaker. Oprah Winfrey will deliver the keynote address for the event, a culmination of the campaign. Other activist-driven events were held previously in London (Apr. 17) and Vancouver (Apr. 12). For more details, visit the Global Citizen Festival website.